I got my rectangles, they really spruce up the apartment. Even though you can't tell by the looks of my very-empty October blogs, I've been hard at work this month spinning and dyeing and carding. I've got 6 new batts and 5 new yarns in the store, and I'm getting a nice head start on Xmas gifts. I've spun some of my favorite yarns EVER this month. Oatmeal Cream Pie (perfectly named by my husband, because "it really looks like it!") is 5 ounces of the baby camel fiber that's been burning a hole in my fiber drawer since I got it last year, and I spun it with an ounce of the angora that I bought on my HONEYMOON. We're coming up on our 2nd anniversary, so this stuff really needed to be put to good use. It took forever to spin, because it was spun much thinner than I usually do, run through the wheel once more to give it way too much twist, then super-coil plied back onto a core thread. I worked on this thing over the course of Adam's weeklong business trip and still had to finish it up after he got back. The end result is awesome though, hopefully someone up north will give this guy a good home. The white bits are impossibly soft. Stained Glass combines my one true love (rainbow color order) with a brand new technique that I have never tried before. 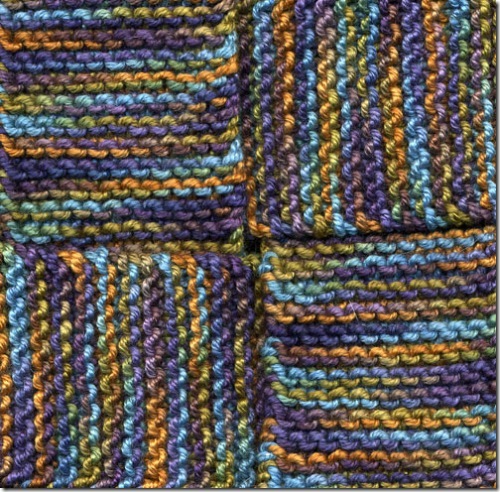 The core yarn is a self stripe rainbow single. But instead of spinning another yarn to ply it with, I ran it through the wheel backwards and just held a clump of uncarded llama fiber touching the yarn. The llama would catch onto the yarn randomly, creating this interesting cocoon effect, like what your hair looks like when you accidentally walk through a cobweb. I secretly hope no one will buy this one so I'll be forced to keep it and knit with it. I would post pictures, but the people getting the gifts might see. Basically everyone is getting fingerless gloves from me. This is the first year since I learned to knit that I'm knitting gifts for people. The first year, everyone got a shawl and after that I got too obsessed with my own stuff to add gifts to my to-do list. Speaking of shawls, I'm not sure if I've told that story on here or not. Anyway, here it is: In 2004 I bought a bunch of furry yarns, got my size 35 needles and made big shawls for my mom and step-mom. Adam saw me and asked "Seriously? You're giving everyone a rectangle for christmas?" No harm done though, everyone loved them. I think. Well, the good news is I'm enjoying myself on Ravelry.com, the bad news other good news is that it's not quite as wholly consuming as others have made it sound. That's a good thing, because I have lots of items on my to-do list that would have to be postponed if I was spending my evenings Ravelry-ing instead of knitting. It's fun, it's cool, it won't replace this place as my home, though. If you're already there, add me as a friend! My username is GrittyKnits. Obviously. In yarn news, I have discovered a heavenly (new?) yarn from the Fiesta company called Swoon. 50/50 Merino/Silk, wonderful colors and very soft. There's also a 100% merino version called boomerang which is also very nice. Both available at the Woolie Ewe. I managed to get a Carmen neckwarmer and 2 pairs of garter stitch wrapped up gloves (from Debbie Bliss's Pure Cashmere book) out of one ball of Swoon. Only one mini-complaint: it dyed my needles and a spot on my index finger a gnarly shade of blue-green-brown and it night need a good soak before it can be worn against skin, lest the wearer look sickly after taking it off. I had a pair of jeans once that dyed my palms blue and it was really embarrassing. This yarn has inspired me to add a new feature to this site: Yarn Reviews. As soon as Adam codes me a new section, I'll be uploading all my yarn likes & dislikes. 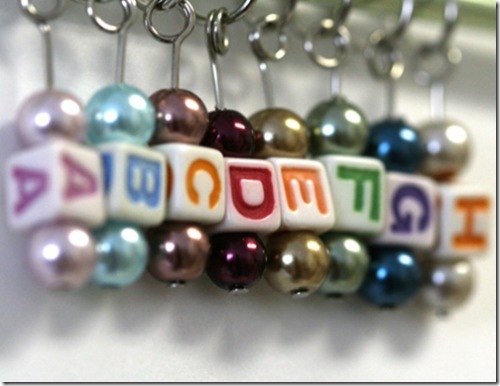 Alphabet sock stitch markers now available! I haven't been doing a whole lot of knitting this week, but I have been a stitch-marker-makin' fool. The new Cat Bordhi sock book New Pathways for Sock Knitters came out, and in order to work the patterns in the book, you need stitch markers with the letters A through H on them. The Skacel company is supposed to be manufacturing them, except they aren't... yet. We called to try to get information, but they have no price info and no delivery date. At this rate I doubt they'll be ready in time for the holidays. But I digress. This actually makes me very happy, because I've been making (and selling) lots of Gritty Knits brand alphabet stitch markers with relatively no competition. I have 2 kinds of frosted-plastic ones and square bead + faux-pearl ones (shown below). For a while they were selling out at the 'Ewe faster than I could make them so I had none left to put in my online shop, but I have caught up and will hopefully have these uploaded by tonight. They're up! Check out the store.